The measure was taken to prevent birds from contracting bird flu from wild birds. ALL BIRDS AT Dublin Zoo have been moved indoors due to the threat of an avian flu. It’s understood that the birds will stay inside for the foreseeable future. Nearly 150 birds have been moved in total. In a statement Dublin Zoo said, “The wellness of the birds in Dublin Zoo is paramount and as per our contingency plan all birds have been moved indoors to our large back of house facilities. This precautionary measure has been taken to prevent birds in the Dublin Zoo collection from contracting bird flu from wild birds. It comes after a wild bird in Wicklow was found to be infected with the H5N8 avian influenza virus. Dublin Zoo said it takes its bird flu directive from the Department of Agriculture, Food and the Marine. A contingency plan was implemented when Dublin Zoo was notified in December. 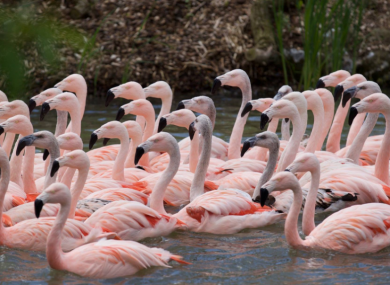 The birds that were moved indoors include a breeding group of 82 Chilean flamingos, 25 waldrapp ibis, 16 humboldt penguins, eight ostriches, five common peafowl, two macaws and a number of chickens and ducks from the family farm. Email “All birds at Dublin Zoo have been moved indoors over flu threat ”. Feedback on “All birds at Dublin Zoo have been moved indoors over flu threat ”.